Up until now, I have had nothing to say about the so-called deficit reduction “Super Committee.” They have been wasting the nation’s time and money in a deadlock which everyone knew would be the case and which has persisted since August. Now their deadline looms. By this Wednesday, they are supposed to present to Congress completed legislation, ready to vote on, which will reduce the Federal budget deficit by $1.2 trillion over the ten years beginning with fiscal year 2013. If they fail to achieve their task, then a process called “sequestration” will do the same thing — remove $120 billion per year from the Federal budget automatically, half from Defense discretionary spending, and half from non-Defense discretionary spending. The committee will fail. Everyone has always known they would. Anyone who said different, any pundit, any member of Congress or the Senate, or the President, was playing cynical games. Here is a chart which shows what we are talking about. The source of the chart is explained below. Note the remarks at the bottom of the chart. Both scenarios reflect a gradual phase down of the wars in Iraq and Afghanistan. 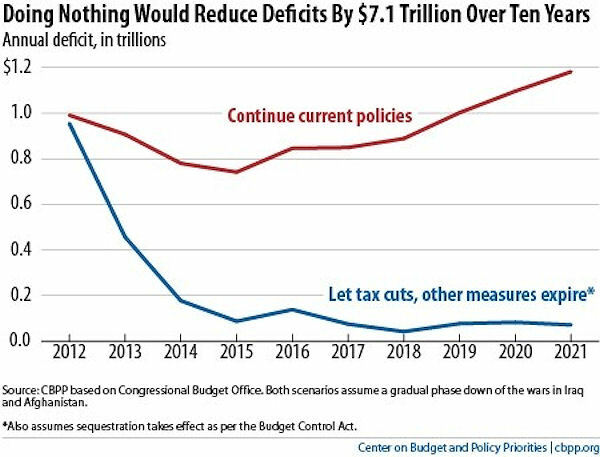 The “Do Nothing” budget assumes that the sequestration process created by the Debt Ceiling legislation remains in place. By fiscal year 2015, the annual budget deficit would be about $100 billion per year, if Congress did nothing. Ezra Klein is, among many other things, a blogger for the Washington Post. For some time now he has been writing about what he calls the “do-nothing-plan” as a means to achieve substantial deficit reduction. It’s very simple. Congress goes home to, in Mr Klein’s words, “spend more time with their campaign contributors.” While they are gone, the Bush tax cuts automatically expire, the 1997 Balanced Budget Act’s scheduled Medicare cuts kick in, the Affordable Care Act is implemented, and the budget moves roughly into balance. — $0.9 trillion in lower interest payments on the debt as a result of the deficit reduction achieved from not extending these current policies. Put another way, all we need to do to solve our deficit problem, is to do nothing. And all we need to do to avoid creating one is to enforce PAYGO rules in Congress. The Democrats are willing and every piece of legislation they have introduced has included a method to pay for it. Up till now, the Republicans have refused to do this. So who is really interested in dealing with the deficit? Of course, the deficit is a phony issue. The Teabaggers seized on it as their signature issue and forced a multitude of policies onto a country which didn’t want them. They now control the House of Representatives, and are able to block any legislation they don’t like in the Senate. The huge deficit we are hearing about continually was cynically created by Congress, which was under Republican control from 2001 until early 2007, and a Republican President. They passed a variety of tax cuts and extensions and delays, all of which favored the rich, and made no attempt to replace the money that this cost our government. They started two wars which weren’t paid for. They created Medicare Part D, ostensibly intended as drug coverage but was really meant as a gift to drug companies. This also was was not paid for. Congress and the President did more besides, which is clear from the list just above. By the time they were done, the government was spending well over $1 trillion above what it took in in taxes. This was deliberate. This was a deliberate attempt to choke off the government’s ability to deal with emergencies and social issues. Republicans could now respond to every emergency and social crisis by bleating the meme that such things were too expensive, the government couldn’t afford it. We have all seen the results of this dishonest scheme by the Republicans — a recession which will not end, an obscenely high unemployment rate, and an economy which is barely stumbling along. Remember this when you vote next November. You don’t give another brick to a thug who has smashed all your windows with bricks. This entry was posted in Political Events Affecting Social Security. Bookmark the permalink.